The Blue Yonder will be featured at the Doing Good Doing Well conference in Barcelona 26-27 Feb 2010. The theme of the conference this year is 'From niche to mass market:taking responsibile business to next level'. The Doing Good Doing Well conference is a two-day event with an interactive panel discussions on major opportunities and challenges faced by responsible businesses and organisations. 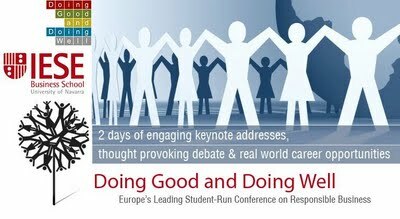 The conference organised by IESE's Responsible Business Club, attracts, proffesionals and students from around the globe. By challenging participants to consider the potential for sustainable development, the DGDW conference helps develop innovative new strategies and business models, as well as foster meaningful relationships between industry professionals and graduate students. IESE is one of the top ranked management school in the world. We will be presenting our case in a panel titled, 'CSR in service sector'. As in previous seminars, TBY will be sharing its opinion on how responsibility should be a main stay of any business and not as a CSR initiative to be part of a 'go-green-agenda'. We are humbled to be invited for this prestigous conference where more than 100 speakers from various sectors and different parts of the world are attending. Very inspiring story.All the best shameer.Keep the spirits high.